Pattern: Wire Menorah/Votive Sleeves by Annie Modesitt from Melanie Falick’s Handknit Holidays. Casting on: I liked the long tail cast-on. Although it’s much more tricky to cast-on this way than to use the twisted loop cast-on recommended in the Handknit Holidays book, it’s much easier to work the first row. Just think of it this way: if you use twisted loop, you’ll need to knit through twisted stitches in the first row. And your yarn is wire. ‘Nuff said ;). Binding off: As attractive as typical grafting may seem, I don’t think this is a good way to proceed. When I tried it, weaving the wire through each of the live stitches twice really took a toll on the working wire’s condition and it ended up breaking halfway through. On the second votive sleeve I just wove the wire through each live stitch once as I joined them to the other side. Not as seamless, but much less work and the wire didn’t break on me. Blocking wire: A must. The wire doesn’t look particularly attractive when it’s just knit, and it isn’t the right shape and size. Gentle tugging works miracles, and if you find the wire to be rough on your hands, use gardening gloves. The right side: The purl side of beaded wire knitting definitely displayed the beads much better than the knit side. But the knit side was also attractive. I guess it’s knitter’s choice! Collecting spilled beads from the floor: Incredibly informative since you see all the dust bunnies in every corner and know exactly what your vacuuming is leaving behind. Based on the number of times I found myself on all fours scouring the floor for dropped beads, you’d think I highly recommend doing this ;). those look great! i’ve been thinking about a foray into the wire knitting world and you may have given me the push i need… (after holiday knitting is concluded that is). Those are awesome! You did a spectacular job. Just be glad you don’t have cats. They make working with beads particularly difficult. Those look great! Thanks for the tips. I’ll definitely keep them in mind when the time comes around for me to make those. Wow – those turned out great! Definitely something that I would love to have in my house. Knitting with wire doesn’t sound like a lot of fun (actually, it sounds kind of painful), but the results are beautiful! Oh, these are so lovely! This is the project that got me to buy the book. Your finished sleeves may get me to move this up on my to-do list! They turned out great! I wonder if different types of wire (copper, aluminium, coated) would knit up differently and if the effects would be noticeable. If you were to shape the wire differently, use real crystal or glass (i.e. 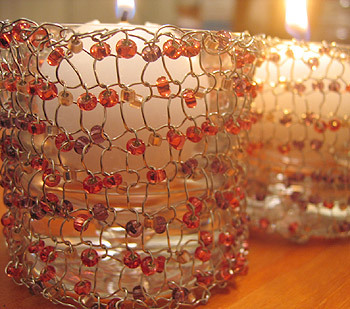 unflammable) beads, and had a clever glass plate underneath, you could ditch the holders completely and have the votives rest in the wire knitting. I’m sure, however, if the book suggested that alternative, it would be law-suit city. The fun thing about knitting with beads is that you find the beads in the weirdest places for YEARS afterwards. Oh, these are fantastic! Really cute. Just like you to put your fine mind to something and succeed at it the first time ’round. Beautiful work! I agree and I’ll say this again, (said this on your previous post with a picture of your progress) — yours looks better than the picture in the book! Kudos, Kathy! beautiful! i am not sure what it is like to knit with wires. but i’d love to try one day! you did a fab job. Very pretty, they don’t look handmade at all. amazing! when do you have the time to do all this?! I’m blown away by each of your creations. Congratulations, Kathy! They are beautiful – much nicer than those in the book! Thanks for continuing to inspire, teach and for continually surpassing the “teachers/designers”! These will be high on my list to knit as soon as the Christmas rush is over! Wow, I loved the shawl from the last post, and now this. You make great projects! Beautiful votive sleeves! And that yarn from the last post is a wonderful color. Your friend is talented! I really want to make these. Sigh. I am sure the wire will ruin any non-aluminum knitting needles, huh? ooo, they are beautiful! i’m so impressed! my own wire knitting experiments have been short and painful. Ooooh! Those are really beautiful!! Those look great. It’s hard to believe that they are actually knitted. They look much more complicated than just knitting. oh, I am so making those eventually. I love that book. They are beautiful and would make a great gift. Here’s a tip to catch stray beads before they hit the ground. Work over a piece of felt or a piece of a vellux blanket. When I do beadwork, I work over one of these pieces of fabric. The beads fall onto the fabric and stick slightly without rolling every which way. Those came out so well! I definitely want to make some eventually! wooo – quick work! 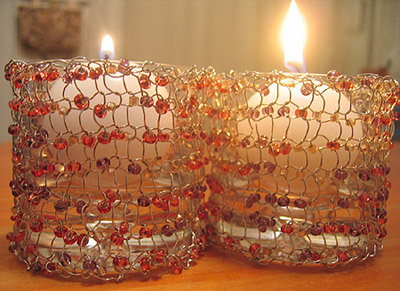 they are gorgeous, and i like the texture-y effect the lighter beads throw in. the picture of knitting with gardening gloves on tickles me. it’s very they might be giants somehow. like everyone else said: very pretty! I may need to buy that book–it seems to have a lot of nice quick projects in it. Wow … lovely! Agree with you that the peach-coloured beads don’t “pop” too much. Very attractive and worth your time! Good suggestions, too. Wow, these are spectacular! I bet if you put a bunch of them together, they’d make a really beautiful, yet nontraditional, menorah. very cool wire knitting. Thanks for the hints. But, I think I’ll stick to wool….. Absolutely gorgeous. I’d love to try this at some point… just not sure whether it would be murder on my hands or not. Beautiful. How was knitting with wire? Hard on the hands at all? They look beautiful! I can’t believe they take so many beads. All bead projects amaze me on that score. Drool. You know how much I love these. those are absolutely gorgeous. I would pay good money to buy something like that. wonderful job.